Make sure the green tea supplement, brewable tea, matcha, or drink you use passed our tests and is right for you! 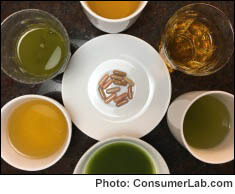 ConsumerLab.com tested the strength and purity of 30 green tea products to help you know what's really in them and how they compare. Green tea contains EGCG and other polyphenol catechins that may reduce LDL cholesterol and lower the risk of developing cardiovascular disease, certain cancers and type 2 diabetes. However, amounts of these compounds in products vary enormously -- from as little as 20 mg to as much as 500 mg -- and are often incorrectly listed on labels or not listed at all. Our tests also showed that when it comes to caffeine, you can't always trust what's listed on green tea product labels. What's more, ConsumerLab found the cost to obtain an equivalent dose of EGCG to range from as little as 5 cents to more than $6.